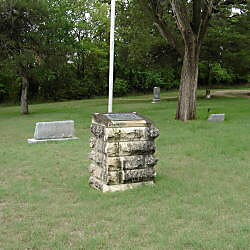 Description: A stone marker is emplaced in the middle of a number of civil war veteran's graves. The bronze plaque mounted on top of the marker reads: "In Memory Of ~ Our Soldiers Who Fought And ~ Died, And Those Who Fought In ~ War And Peace To Defend The ~ Rights And Freedoms Of Our ~ Beloved Land. ~ This Memorial Made Possible By The ~ Generosity Of ~ David Ross Gordon ~ 1956". 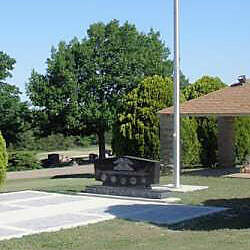 Description: A black granite monument is placed next to a flagpole. A memorial plaza is in front. The front of the monument is inscribed: "Honor - Memory ~ "The Willingness To Sacrifice Is The Prelude To Freedom" ~ Dedicated With Appreciation To The Men And Women Whose Loyalty And Service ~ During Times Of War And Peace Define The Character Of This Great Nation." The base is inscribed: "The Avenue Of Flags Project Has Been Made Possible By Abilene Area Veterans And Their Families"
The back is inscribed: "Honor - Memory ~ " As We Stand Here In Grateful Remembrance Of The Veterans Contributions We Renew Our ~ Conviction Of Individual Responsibility To Live In Ways That Support The Eternal Truths Upon ~ Which Our Nation Is Founded, And From Which Flows All Its Strength And All Its Greatness." ~ Dwight D. Eisenhower, Feb. 8, 1960". A plaque at the base of the flagpole reads: "Flag Pole Donated ~ In Honor of All ~ Veterans ~ by the ~ Richard & Delores Rider ~ Family". Paving stones in the plaza include "Henry H. Tobias, Co D, 1st BN PA INF" and "James W. Purdy, Corp KS Calvary". 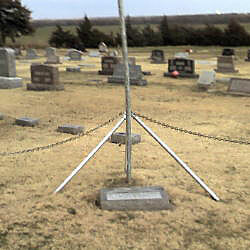 Description: A granite marker at the base of the cemetery flag pole reads: "To The Dedication & Honor ~ Of All Veterans ~ Flag Pole Placed By Laverne W. Reiff ~ Korean Veteran". 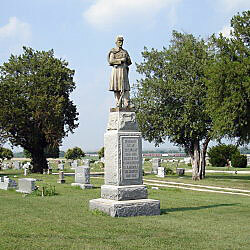 Description: A granite soldier monument is emplaced in the north half of the cemetery. The inscription reads: "In Memory ~ Of The ~ "Boys In Blue ~ 1861-1865 ~ Erected 1914 ~ By The Herington ~ G.A.R. And W.R.C. ~ "One Country ~ One Flag". 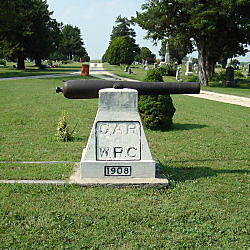 A 3-Inch Ordnance Rifle is mounted on a concrete base in the center of the cemetery. The inscription reads: "G.A.R. ~ W.R.C ~ 1908".